It is interesting how the family room is truly the part of the home that is far more “lived in” than the formal living room. Aside from the kitchen being the common gathering area, the family room offers something exciting for everyone in the family – as well as their guests. A family room is both the functioning and welcoming area, allowing for a large variety of entertainment to bring family together in harmony. Like the seasons, a family room is constantly changing and adapting to the needs of the household. Family room remodeling is an exciting project for the entire family, as every member—young and old—has something to contribute to the design and transition taking place.The creative possibilities for family room design are endless, thus “to the family room and beyond” is a journey the whole family will enjoy! 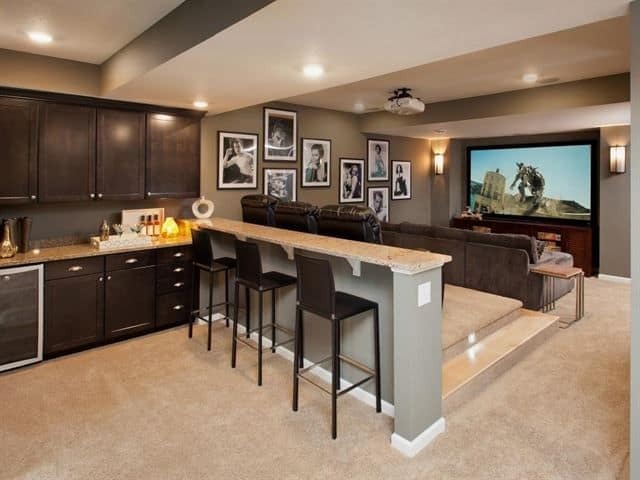 The focal point of the family room that undoubtedly grabs the most attention is the media center. Not to say we are all TV obsessed with today’s endless choice of entertainment channels, but sometimes with a family’s busy schedule, gathering around the family room to watch TV or play video games is the one time in the day they might get to enjoy something fun together.Therefore, more homeowners are splurging with their media center designs and remodeling. It’s no secret that high prices at the theaters are also moving more people to think about remodeling their current media centers with full home movie theaters and complete surround sound systems. A lovely fireplace incorporated into the media center is another popular option that Las Vegas contractors are finding more home owners are requesting. The arrangement of the flat screen TV hanging above the fireplace offers a cozy ambiance while watching a favorite movie or football game. A library area with shelving and colorful books is an attractive asset to your family room,which not only creates warmth in the room,but reflects your interests and character. If your room has high ceilings, you can have a rolling ladder installed to navigate to your book shelves. A family room that is open to the kitchen is most functional so that whomever is on cooking duty or the host of the party can participate in all the activity happening in the family room. If you entertain often, incorporating a full bar with sink, refrigerator, wine rack and other features may be a perfect fit for your new family room remodeling design. As families are finding their schedules are busier than ever these days, having time for family activities in your home is paramount. Being able to enjoy a variety of activities right in your own family room means more opportunity for quality time with family and friends. Remodeling your family room allowing for games such as pool, ping pong, shuffleboard, or air hockey, is always fun for the whole family. Perhaps your family’s passion is music, andhaving a corner stage for karaoke or an area for your piano and other instruments would be of interest in your remodeling design. If you have younger children, designing attractive storage areas throughout the family room is a perfect way to keep your room tidy and yet functional for all the little ones to have fun. Creative storage is becoming more popular for contractors in Las Vegas to design and install. Before deciding on your overall design for your new family room remodel, it is imperative to have a comprehensive plan for lighting your space, especially when a room is being used simultaneously by several people for different purposes such as watching tv, reading, playing games, and socializing. Recessed ceiling lights arranged throughout the room with controlled lighting is perfect for illuminating a multi-functional family room. Your Las Vegas Contractor can help you decide the best lighting systems for your family room design. With a family room as the central gathering space for relaxing, entertaining, or enjoying various activities with your family, remodeling your family room to meet the needs of everyone in the family should be high on one’s home improvement list. The family room allows us to relish in each other’s company, creating treasured memories for all!